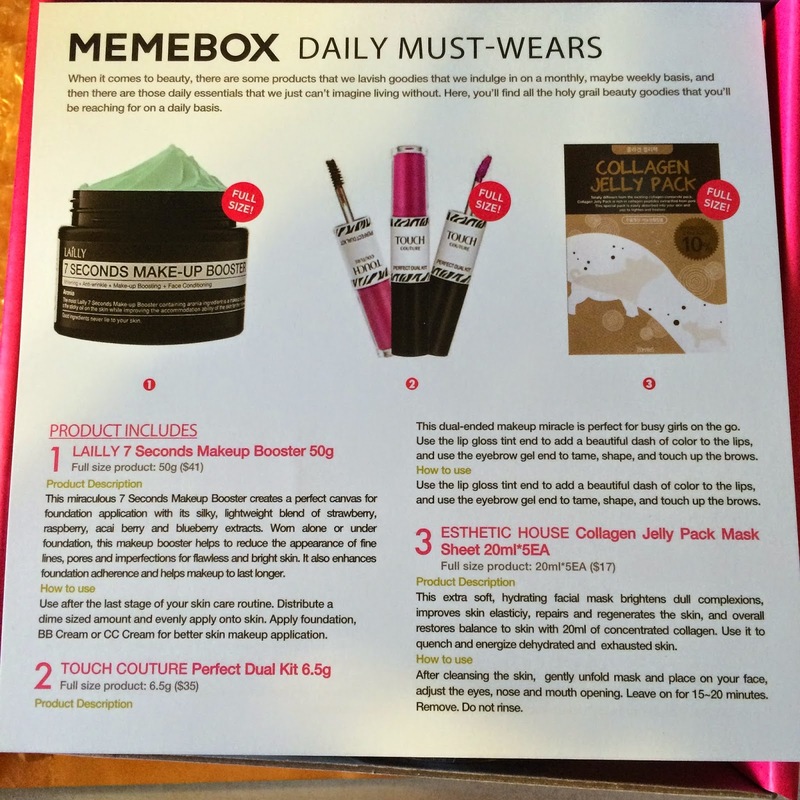 This Memebox is another I purchased in a value set, called "Daily Must Wears." This box is said to contain items we'd look forward to using almost every day, which sounds like it would contain a lot of fun - must have - items. Let's take a look inside, shall we? This cream is supposed to prepare your face for your makeup, even underneath bb creams. It's supposed to fill pores and blur imperfections - sort of like a primer. I find this cream to make a nice primer underneath a bb cream or even just a powder, but I do prefer another actual makeup primer on top of this if I'm using foundation to help my makeup last longer. This product makes a good blurring cream, but it's not my favorite stand alone primer product. This double ended makeup item is supposed to be for girls on the go. Personally, I've never touched up my brows while out and about with my day - but maybe I should start? Haha! The lip gloss is a nice sheer pink color that I could see myself being able to keep in my purse for wearing during the day. The brow gel does a decent job of sculpting my eyebrows, and I will continue to use it daily! I love me a good sheet mask, and getting them in Memeboxes always brings a smile to my face. I love the little piggies on these sheet mask envelopes, they're so cute! These masks contain collagen which is not only good for adding elasticity to the skin, but also for regenerating and moisturizing the skin as well. I feel like these masks not only add moisture and elasticity, but also moisturize - perfect for repairing damage from this windy cold winter! This mask is for dry, damaged hair, and can also be used as a regular conditioner. It forms a protective layer over your hair and prevents further damage and breakage. It smells great, is not oily at all, and really sealed up my hairs' pores - I would buy this again for that reason alone to help seal up my hair color! 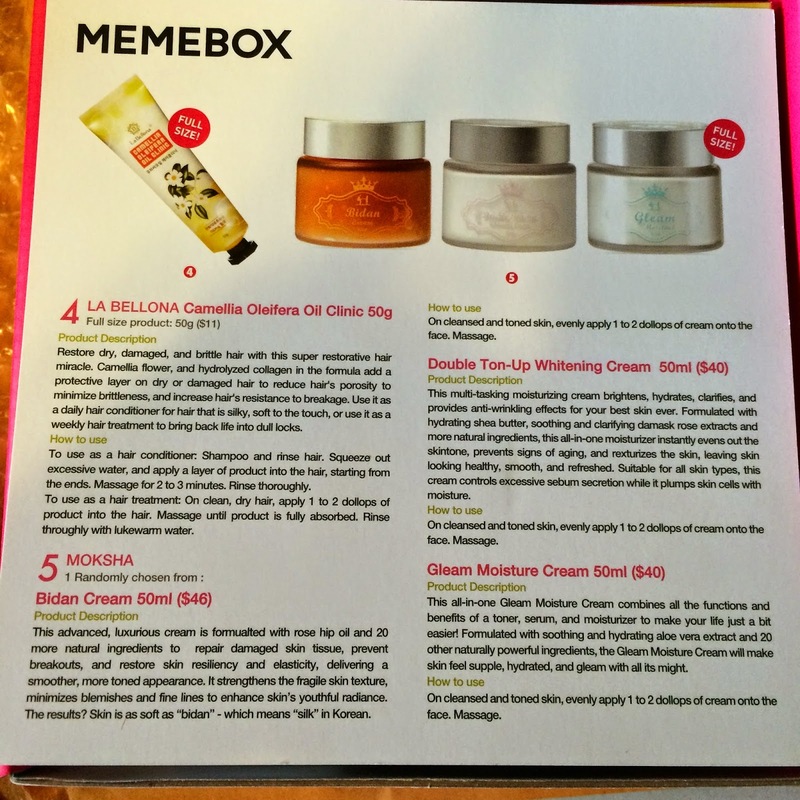 Each "Daily Must Wears" box contains one of three Moksha face creams, and the cream I received states it's for whitening in the title - but I was very surprised and pleased to see that it also helped with brightening, hydrating, clarifying, and anti-aging. I was worried it would be too rich for my oily skin since it contains shea butter, but I am happy to report that this cream is moisturizing, but doesn't cause excess oil production - and I can even wear this during the day! It does cause an immediate lightening effect, but it is not permanent. I feel like it may be lightening sun spots, but it is not whitening my entire face, which is a good thing! I am very happy with this cream and think it offers so much more than the name of the product implies. 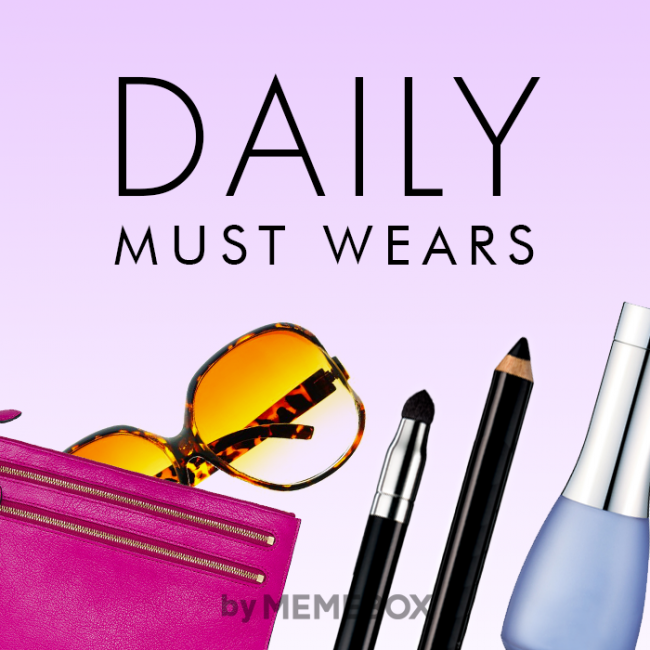 Do you have any thoughts on the "Daily Must Wears" Memebox?